Friendship: The importance of friendship and how to make more friends as an adult. Though following my recent trip to Legoland with my family, taking my children to watch the Lego Friends show where the girls sing together “Me and my girls, best friends forever….” If you have not had the pleasure of knowing the song I am referring to, here you go, enjoy…. … And yes, I do know the dance moves and did do them in public…..
Today then, we’re talking about having lots more BFFs, even though we may not call them that when we hit our mid 40s and upwards….. As adults, we need to make an extra effort to make friends. Up until we’re in our early to mid 20s or so, friends were just thrown at us in school or in extracurricular activities. It’s different as adults because you have to put in some actual work or make an effort. The beauty being that you also get a lot more choice and freedom in making friends. It can be a bitter pill to swallow to realise that an established friendship is simply someone who has been in our life for years, but we actually don’t really enjoy the friendship or even want to be friends with them. If all our friends were made out of forced situations, like family, school, or work, instead of genuine similarities, then maybe we need to find new, fulfilling friendships. Why bother though? What are the benefits of friendship? Friends raise your spirits and comfort you in times of need: Friends can become an important backbone, a powerful support. They are the people who will celebrate with you and help you enjoy your successes. They also listen, advise and support if you hit a rough patch, helping you back onto your feet. True friends are there for you, no matter what. Friendships develop your social skills: Most people that meet me tend to think I am an extrovert because of my behaviour and manner in public circumstances. Yet it takes a lot of effort for me to get there in the first place and the prospect of social events often makes me anxious and uneasy. I am much more introverted than people realise and without friendships that nudge me and push me out of my comfort zone, and also assist me in feeling more resilient and safe in my own skin. Friends offer us great opportunities to socialise and get out into the world to experience stimulating places and people, and we develop our social skills as a result. Quality friendships help you tune into reality FM: If someone needs to hear some truth, friends are well-placed to offer up a reality check. If that friend has been inappropriate, needs to recognise something in themselves or others, true friends can offer that harsh truth because it is offered from a caring place in their heart. Friends will be honest even with sensitive issues. Friendships with other couples can help your own relationship: With emergence of social media, many people create idealised or fantastical ideas about romantic relationships; spending time with other couples can help you see other relationships in reality. Likewise, going through major life transitions together can give you insight, support and understanding too – marriage, raising children, balancing work/life commitments to maintain relationships are all areas that you can be helped with as a result of sharing such experiences within friendships. Certainly, I learn so much from my friends who are parents who reassure me, support me and guide in so many ways. Importantly, friendships improve our health and advance longevity: Studies demonstrate that older people with quality friendships typically tend to live longer, healthier happier lives than those without. Having a close knit family circle can offer similar benefits in other ways, but usually becoming a caregiver is more of an obligation, whereas good quality friendships provide heightened joy and fulfilment with less of the strings attached. 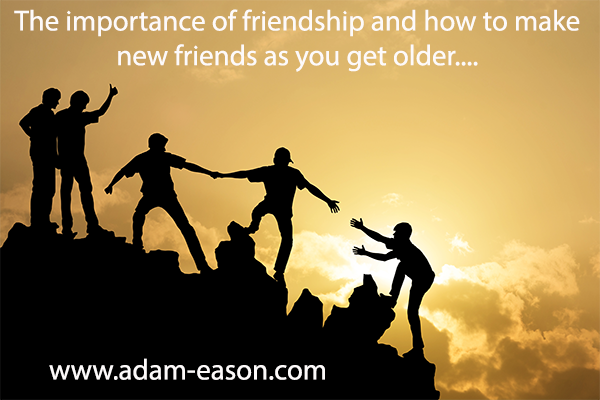 There are several ways to meet new people and establish friendships as you get older. Much of this hasn’t changed from when you were in school and friends were lurking around every corner. • Join a club of an interest or passion you have. • Talk to people when out and about. • Join a sports team or regular sporting activity of some kind. • Take up a hobby. • Sit in on seminars/lectures or related events. • Take a meditation or yoga classes or similar group. • Go on a solo trip somewhere. If you are participating in workshops, classes or other activities, make sure it’s something you actually like to do, not just something you think would be good for meeting people! Another option is to reconnect with old friends with whom you think it might be worthwhile to re-establish a relationship. Most of us are presented with many opportunities to make new friends, but we’re not taking them. Maybe we don’t know how to take them. We meet new people, but how do we progress from there? How do we grow a one-off encounter into a friendship? The key to making friends is to first talk to a stranger, and second, talk to them again later. 1. Go out on a limb and take a risk. Don’t wait for someone else to make the first move. Why should it be up to someone else to choose you as a friend? You can choose them! Invite someone you’ve met and like to go for a coffee or attend an event. Just ask. It’s amazing what we get when we just ask for what we want. Keep up the communication with someone you’d like to befriend. Email, text or call them regularly. Friendships are created, they don’t just magically happen, which means you need to invest some work in creating them. If the person you’d like to befriend can’t make it the first time you suggest getting together, a) don’t take it personally, and b) try again. Them being unavailable doesn’t mean they don’t like you, it simply means they are unavailable. Try again. Give it a good three tries before you move on to the next person (or suspect that they don’t like you by telling you they are washing their hair every night for the rest of their lives!). Establishing a friendship takes time, and certainly more than two or three coffees or nights out. It can take months, if not years to establish a deep bond. In a new report published in the Journal of Social and Personal Relationships, Associate Professor of Communication Studies Jeffrey Hall found that it takes roughly 50 hours of time together to move from mere acquaintance to casual friend, 90 hours to go from that stage to simple “friend” status and more than 200 hours before you can consider someone your close friend. Putting in the effort now will pay off in the long run. I have typically found that getting drunk with that individual reduces the number of hours required to establish the high quality friendship, though is not necessarily the best guidance and advice….!! Though without doubt, having adventures, sharing laughter and having shared experiences of one kind or another will advance any and every friendship. 5. Don’t limit yourself to one new friend. Make several. The more the merrier. 6. Be the friend you’d like to have. Be trustworthy, be kind, be supportive, be funny, be all the things that you’d like in a friendship and you’ll create quality relationships with people. Why Are You Doing All the Work? Some people are initiators, and some are not. If you are an initiator, it can be frustrating to feel like you are always the one doing the organising. If it really bothers you, have a conversation about it with your new friend. Offer up some well-intentioned feedback. Otherwise, take pleasure in the fact that you’ve connected with someone new and find a way to accept your role as an initiator. Making new friends. It doesn’t have to be hard, it just takes a dash of risk and a pinch of effort, and before you know it, you’ve made a new friend. Those friendships will offer you so much in return, you’ll be rewarded greatly as a result of quality friendships as you get older. Off you go, get out there and rekindle old friendships, strengthen weakened friendships and develop new friendships. We’ll be remembered for whom we touched throughout our journey in life, life is so short, go make an impact in the world by having friendships. 1. Do you need help or support in a particular area of your life? Need to learn to develop friendships? Likewise, if you’d like to learn more about self-hypnosis, understand the evidence based principles of it from a scientific perspective and learn how to apply it to many areas of your life while having fun and in a safe environment and have the opportunity to test everything you learn, then come and join me for my one day seminar which does all that and more, have a read here: The Science of Self-Hypnosis Seminar. Alternatively, go grab a copy of my Science of self-hypnosis book. Self-hypnosis can help you to develop friendships too, in a number of ways. Have you never tried self hypnosis to get rid of some of the anxiety before going to social events? I absolutely do Afraz – it helps me present to hundreds and hundreds of people each year at large events and conferences where I connect with lots of people – and I lead a fairly busy social life with no major problems. Yet it does not come naturally and easily to me – and self-hypnosis does not make you immune to everything. It helps a great deal, but does not make me impervious.